The election of President Donald Trump, along with the GOP’s success in keeping control of Congress and their big wins at the state level in recent years, have left Democrats without a clear leader. And until one emerges, the role of “most powerful Democrat” will be a topic of some debate. Still, it’s obvious that some Democrats have attempted to fill the void in various ways, including a couple who have formally retired from politics. Here are seven Democrats who could help lead their party through the wilderness. It was proof of Obama’s staying power both as a symbol for Democrats and as a voice in the party. The fact of the matter is, Obama left office with the highest approval ratings he’d had in years: he remains immensely popular among Democrats, and likely will continue to do so. President Trump on Obama: "He likes me"
Combined with the inherent power former presidents have in influencing the political discussion, Obama could be a powerful voice against Mr. Trump. There were hints that he’s willing to speak out when he deems it necessary: his statement in support of the protesters after Mr. Trump signed his travel ban, which said citizens like the protesters are the “guardians of our democracy,” indicated he is unlikely to stay silent when Mr. Trump takes things too far. Obama’s next act is still unclear: it seems unlikely that he’ll go the route of his predecessor, George W. Bush, and step back from public life almost entirely. And at 55, he’s among the country’s youngest ex-presidents, so he has plenty of time for his post-presidency. Kitesurfing is bound to get old. The most popular politician in America is also the leader of the Democrats’ surging left wing. After his surprisingly strong run for the nomination of a party he is not even technically a member of, Sanders is now the most successful socialist politician in American history. He’s also the one best-positioned to talk to the youth of the party, which is increasingly critical of capitalism and disdainful of the wealthy. At 75, it’s unlikely Sanders will ever be the Democrats’ pick for president. But that doesn’t mean other aspirants won’t be lining up to kiss his ring as we get closer to 2020. When New York Gov. Andrew Cuomo, for example, recently unveiled his plan to eliminate tuition payments for low-income students at state universities, he asked the Vermont senator to co-headline the announcement. We don’t normally associate septuagenarian socialists with energy and charisma, but if Democratic politics has one rock star right now, it’s almost certainly Sanders. Hillary Clinton’s failure to win the presidency damaged her party, but not Sanders, the man who his supporters would’ve easily beaten Mr. Trump if he had only been given a chance. Sanders and his advocates say that they’re the future of a new and uncompromisingly leftist Democratic Party. And right now, in the age of Trump, it’s looking more and more like they might be right. The de facto leader of the Democratic Party is in an uncomfortable position. On the one hand, the liberal base is demanding he do everything possible to stop Mr. Trump’s nominees. On the other, he has political realities to consider, like the fact that Republicans control both houses of Congress and the White House. But Schumer is nothing if not a strategic thinker, which is why he was the obvious candidate to take over following Sen. Harry Reid’s retirement. Plus, Schumer has the benefit of knowing Mr. Trump better and longer than perhaps any politician in Washington – the two outer-borough New Yorkers have a longstanding friendship, and Mr. Trump has given Schumer plenty of cash over the years. Perhaps that’s the kind of knowledge that can pay serious dividends at the negotiating table. Or not. Either way, Schumer’s role as the leader of the opposition in the Senate means he’s a force for both Republicans and Democrats to reckon with. The ex-VP still commands a lot of love and loyalty from the Democratic faithful, and his endorsement in intraparty contests will still be sought for years to come. For liberals who will always look back fondly on the halcyon days of the Obama administration, the attraction is even more powerful. “Uncle Joe” was the loveable mascot of Democratic politics during some of the best year’s of the party, and will remain beloved among it ranks for as long as he lives. Plus, Biden speaks the language of the demographic considered most responsible for declining Democratic fortunes: the white working class, which abandoned them in droves for Mr. Trump in 2016. That’s because to many, Biden is a throwback to the golden age of liberalism, a time when unions were strong and filled with reliable Democratic voters. He’s also arguably one of the few remaining examples of old-school politicians – ones who worked their way through state schools and remained middle class and plainspoken even as they ascended to the peak of power. They don’t make ‘em like Joe anymore, and they never will again. Plus, is there any Democratic politician, with the exception of Obama, who enjoys such broad support and affection within the party’s fractious base? Biden can walk with kings but keep the common touch, gliding throughout the world as a senior statesman while still knowing how to talk to every group in the Democratic coalition. A utility player if there ever was one, expect Biden to be drafted to speak to everyone from African-Americans to Midwestern whites to northeastern millionaires in 2018 and 2020. They all know Joe, and they all like him. The Democratic base is consumed by anger, and one Minnesota senator has given them an acerbic and entertaining voice. 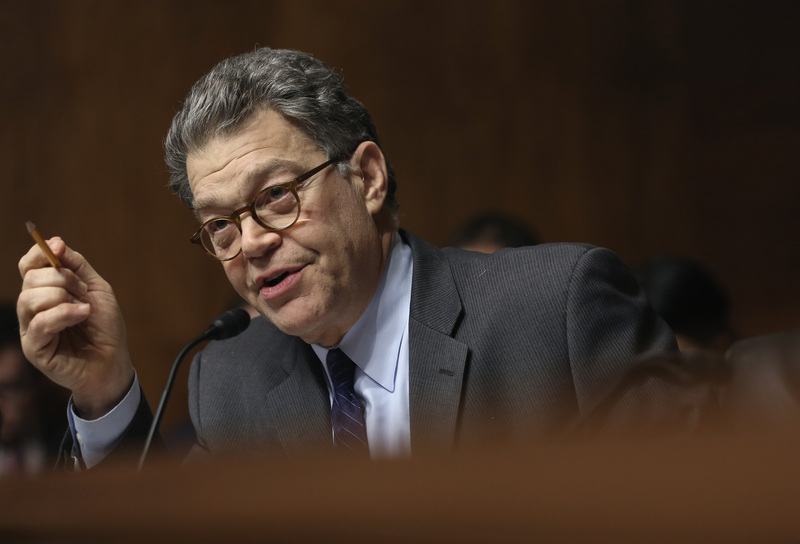 Franken has been in Congress for nearly a decade, but he’s eschewed the limelight until only recently. His breakout moment came during the hearings for President Trump’s cabinet nominees, where he was quick to draw blood. Sen. Jeff Sessions, Mr. Trump’s pick for attorney general, was embarrassed by Franken’s questioning, which showed the Alabaman embellished his resume when it came to prosecuting civil rights cases. Betsy DeVos also came out damaged by Franken’s questioning, which showed her to be somewhat ignorant in matters of education policy. And Tom Price, the nominee for health and human services secretary, was unprepared when Franken brought up his investments in Big Tobacco. All of this has lead to chatter that Franken, having finally shed the image of a comedian who plays at politics, might be a credible contender for the presidency in 2020. Franken says he’s not interested – but then again, that’s what presidential aspirants often say this far out from Election Day. Bernie Sanders may have finished the 2016 campaign as the newest hero of progressive Democrats, but Warren was the progressive icon who originally rose to prominence on a platform of anti-Wall Street, anti-income inequality frustration. Still, even Warren has her limits among the party’s progressive base. When she voted in committee for Ben Carson as secretary of housing and urban development -- just days after grilling him during his confirmation hearing -- she got major blowback from the left wing of the Democratic Party and found herself on defense with the progressives who normally adore her. There aren’t many fresh faces on the Democratic scene after 2016, a relatively dismal year for Democrats at the ballot box that quite literally produced few major new Democratic officeholders. But of the newcomers, one stands out as a potential new powerful voice in the party: California’s junior senator, Kamala Harris. Harris, formerly the attorney general of California, has long been considered a rising star in the Democratic Party and cemented that reputation by easily winning her Senate race in November. In the weeks since she’s taken office, Harris has only bolstered her spot on lists of potential Democratic presidential candidates for 2020 and beyond. She has been a vocal and visible part of the opposition to the new president: she grilled Cabinet nominees on issues of LGBT discrimination and climate change, held a prime speaking slot at the Women’s March on Washington and turned up in front of the White House the following weekend to protest Mr. Trump’s travel ban.